Thailand promotes itself as amazing, Vietnam can well be described as bustling, Cambodia's Khmer temples are awe-inspiring... but the adjective that was most often applied to Laos is forgotten. This is changing fast however, with tourism being the biggest growth sector in Laos with ever rising visitor numbers under its new tourism slogan 'Simply beautiful'. Visitors who are drawn by the laid-back lifestyle and the opportunity to watch the sunsets on the Mekong will simply explain the attraction by revealing that the true meaning of "Lao PDR" is Lao - Please Don't Rush. Travelers on a tight budget should be aware that prices here can be several times that of neighboring Thailand. The equivalent distance of that 140 baht economy bus ride Chiang Mai to Chiang Rai will cost 60000 kip (300 baht) from Huay Xai to Luang Namtha. 500 grams of boiled rice you might get for 15 baht in the Thai market will cost 5000 kip (25 baht) in Laos. 1.5lt bottled water (13-15 baht 7-11) also 5000 kip. The list goes on. But you can drown your sorrows for slightly less in Lao. Laos is squeezed between vastly larger neighbours. First created as an entity in 1353, when warlord Fa Ngum declared himself the king of Lan Xang ("Million Elephants"), the kingdom was initially a Khmer vassal state. After a succession dispute, the kingdom split in three in 1694 and was eventually devoured piece by piece by the Siamese, the last fragments agreeing to Siamese protection in 1885. 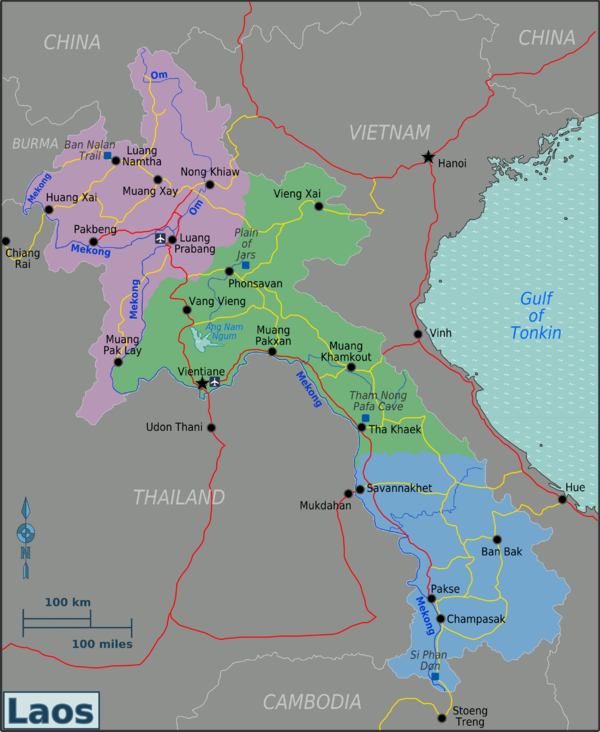 The area east of the Mekong, however, was soon wrenched back from Siam by the French, who wanted a buffer state to protect Vietnam, and set up Laos as a unified territory in 1907. Briefly occupied by Japan in 1945, a three-decade-long conflict was triggered when France wanted to retake its colony. Granted full independence in 1953, the war continued between a bewildering variety of factions, with the Communist and North Vietnam-allied Pathet Lao struggling to overthrow the French-leaning monarchy. During the Vietnam War (1964-1973) the United States dropped 1.9 million tonnes of bombs on Laos, mostly in the northeast: for comparison 2.2 million tonnes of bombs were dropped by all sides in World War II. In 1975, after the fall of Saigon, the Communist Pathet Lao took control of Vientiane and ended a six-century-old monarchy. Initial closer ties to Vietnam and socialization were replaced with a gradual return to private enterprise, an easing of foreign investment laws, and admission into ASEAN in 1997. Despite being just one hour by air from the hustle and bustle of Bangkok, life in Laos has continued in much the same way it has for hundreds of years, although things are now slowly beginning to change. In the mid-90s the government reversed its stance on tourism, and then declared 1998 "Visit Laos Year" - but despite their efforts and all Laos has to offer, monks still outnumbered tourists throughout the country. This is now rapidly changing, with tourist numbers rising every year. Indeed, Vientiane is a laid-back, yet charmingly cosmopolitan village. Despite its small population, Laos has 49 ethnic groups, or tribes, from which Lao, Khmou and Hmong constitute approximately three-quarters of the population. Most tribes are small, with some having just a few hundred members. The ethnic groups are divided into four linguistic branches: Lao-Tai languages represented by 8 tribes, Mon-Khmer languages with 32 tribes, Hmong-Mien languages with 2 tribes and Sino-Tibetan languages represented by 7 tribes. Laos is officially Buddhist, and the national symbol, the gilded stupa of Pha That Luang, has replaced the hammer and sickle even on the state seal. Still, there is a good deal of animism mixed in, particularly in the baci (also baasi) ceremony conducted to bind the 32 guardian spirits to the participant's body before a long journey, after serious illness, the birth of a baby or other significant events. Lao custom dictates that women must wear the distinctive phaa sin, a long sarong available in many regional patterns; however, many ethnic minorities have their own clothing styles. The conical Vietnamese-style hat is also a common sight. These days men dress Western-style and only don the phaa biang sash on ceremonial occasions. Nowadays women often wear Western-style clothing, though the "phaa sin" is still the mandatory attire in government offices (not only for those who work there, but also for Lao women just visiting). The hot season is from March to May, when temperatures can soar as high as 40°C. The slightly cooler wet season is from May to October, when temperatures are around 30°C, tropical downpours are frequent (especially July-August), and, in some years, the Mekong will flood. The dry season from November to March, which has low rainfall and temperatures as low as 15°C (or even to zero in the mountains at night), is "high season" (when the most tourists are in the country). However, towards the end of the dry season, the northern parts of Laos — basically everything north of Luang Prabang — can become very hazy due to farmers burning fields and fires in the forests. [[Pha Tad Ke Botanical Garden]] — the country's first botanical garden dedicated to biodiversity conservation and sustainable tourism. Plain of Jars — Iron Age cemetery sites located near Phonsavan; also one of the main locations to learn about the "Secret War". The people call themselves Lao and the language is Lao, so where did that "s" come from? The answer seems to be a mistranslation from French: somebody read royaume des Laos ("kingdom of the Lao people") as royaume de Laos ("kingdom of Laos"), and the name stuck. The official name, however, is Lao PDR and, should you have any incoming mail, using it will increase the odds of it passing the censors. Russians, Korean, Japanese, Swiss and ASEAN nationals including Indonesia, Malaysia, Singapore and Philippines can enter Laos "visa free" ; all other tourists need a visa in the form of a tourist visa (for one or possibly two months) issued by a Lao embassy or consulate. A visa on arrival is also available to most people entering at the airports in Vientiane, Luang Prabang and Pakse, as well as the Thai-Lao Friendship Bridge between Nong Khai in Thailand and Vientiane and on the Lao/Vietnam-Border. It is also available when entering via Stung Treng (Cambodia), although guesthouses in Cambodia and the Lao embassy in Phnom Phen will say it is not to make money with visa services. When applying for a tourist visa or to obtain a visa on arrival, one (maybe two at Lao embassies) passport photo is/may be required (although you may be able to pay a USD1 "fee" to have this requirement waived) - recently (June 2013) passport photos were not asked for (at Friendship Bridge).Update: As of February 2016, "a" passport photo was required to staple to the immigration form. It did not have to be a photo of the person whose correlating passport was being submitted (i.e. purely a formality). Besides the price, there is also a 1$ service charge applicable to all visas Jan 2018). Visas can be obtained in advance from Lao embassies/consulates. The fee varies by nationality/embassy; USD20 is common, although can be as high as USD63 (in Kuala Lumpur). Processing times also vary; 2-3 days is typical, though you may be able to pay an extra small amount (around USD5) to receive the visa in as little as one hour. In Phnom Penh the travel agencies can arrange the visa the same day (but may charge as much as USD58) while getting it from the embassy takes a few days. Getting a visa from the embassy in Bangkok costs around 1,400 baht for most nationalities, plus 200 baht more for "same day" processing. It's cheaper and quicker to get one at the border. Visas are also available at the Lao PDR consulate in Khon Kaen, Thailand. Thai and English (limited) are spoken by consular staff. Hours are Monday-Friday 08:00 to 12:00 and 13:00 to 16:00. (UPDATE July 2012): There have been several changes that took place in February 2012. Prices have increased and are now similar to those charged by the Laotian Embassy in Bangkok. Visas for Americans, Britons, and those from several EU countries cost THB1,400 baht/USD45, Australians and New Zealanders pay THB1,200 /USD38, Canadians pay THB1700 /USD54 while Chinese pay THB600/USD20. Officially, visas can be picked up the next day (or pay an additional THB200 to have the visa issued within 1 hour). Officially, only baht is accepted. They may take US dollars but it will likely be more expensive than a visa-on-arrival. Given that a visa for many countries can be had for USD20-42 at the border, getting a visa at the border is cheaper and quicker. NOTE: If you are taking the direct Khon Kaen to Vientiane bus and you require a visa for Laos, the bus company will not sell you a ticket unless you have a visa already issued. UPDATE (March 2013): The Laotian consulate has re-located to a big gated building off of Friendship Road. The consulate is about 1 km north of the Khon Kaen Immigration office. It's on the southbound side of Friendship Road (going towards Nakhon Ratchasima). The consulate is on the same side of the road as the Khon Kaen Immigration office. It's also about 500m from a large Tesco Extra which is on the opposite side of the road. Visa prices are still the same as above. There are visa-on-arrival facilities at the international airports in Vientiane, Luang Prabang and Pakse, and at all border crossings (see below), including now overland from Cambodia (visa on arrival facilities opened at Voen Kham -north of Stung Treng, Cambodia). The cost varies between USD30 and USD42 (if paid with US dollar notes; paying with Thai baht will cost considerably more and border officials will not accept Lao kip at all). If you pay in Thai baht, the cost is usually THB1,500 (about USD47-48). A USD1 "out of office hours/overtime" surcharge, and a small (possibly THB10 to USD1) entry stamp fee, might also be charged. Entry permit extensions (sometimes referred to as "visa extensions") are available from the Immigration Department in Vientiane, the Immigration Department in Luang Prabang, the Police Station in Pakse, the Police Station opposite the Lao-Mongolian Hospital in Phonsavan and possibly other cities. Extensions are not possible in Lao's second city, Savannakhet, although you can do a border run from there to Thailand to get a new 30 day visa. The cost is USD2 per day plus a small "form fee" ranging between 5,000 kip (Pakse) to USD2 (Luang Prabang.) In Vientiane it's 5000 kip for the form and 3 usd for application fee. The exchange rate is bad so better pay in usd if you have. The process is very easy; turn up in the morning with your passport and one photo; fill in a form (in Luang Prabang immigration officers do this for you) and come back in the afternoon for your extension. If you want to extend for longer than two weeks and are near the Thai border, it can be more cost effective to cross the border (entry to Thailand is free for most western nationalities) and return immediately to get a new 30 day Lao visa. If you are over 65 then a visa extension is free, with a 50,000 kip administration fee at immigration offices and police stations, and saves you a border run! Extensions are also possible via agencies elsewhere in Laos (who will courier your passport to Vientiane and back again, around USD3 per day minimum of 7 days). The international airports at Vientiane and Luang Prabang are served by national carrier Lao Airlines and a few others, including AirAsia from Bangkok and Kuala Lumpur, Thai Airways, Bangkok Airways (Luang Prabang only) and Vietnam Airlines. Some seats on flights of Vietnam Airlines are reserved for Lao Airlines (code-sharing / better price). Pakse is the third international airport, with flights to/from Siem Reap (Vientiane - Pakse - Siem Reap by Lao Airlines) and from/to Ho Chi Minh City. A cheap option for getting to Vientiane is to fly to Udon Thani in Thailand with discount airlines Nok Air or Air Asia and connect to Nong Khai and the Friendship Bridge via shuttle service directly from the airport (40 minutes); from here Vientiane is just 17km away. There are regular buses between Vientiane and Udon Thani town taking around 2.5 hours. From Vientiane they cost 22,000 Kip (or 24,000 on "peak" days). If you're coming from Chiang Mai, please note that there are no ATM or money changing facilities at the international departure terminal of the airport. If you're planning to get a visa on arrival in Laos, make sure you get enough US dollars "'in town'" before you leave for the airport. Thai baht are also accepted, but at very inflated rates. The long-awaited first link across the Mekong from the Thai town of Nong Khai to Tha Naleng near Vientiane finally opened in 2009. There are two shuttle services per direction per day, with one timed to connect to the night trains to/from Bangkok. Visa on arrival is available when crossing the border by train. The train is not a very attractive option because the railway station is in the middle of nowhere. A train line connecting Laos with China is currently under construction, financed by the Chinese government. It will connect Kunming in China's Yunnan province with Vientiane, with stops in Luang Namtha, Udomxay, Luang Prabang, and Vang Vieng. Most border crossings open for foreigners, with an indication where visas on arrival can be issued, are listed on the web site of the National Tourism Administration. This list is unfortunately incomplete. Visa on arrival for Laos is now available (as of Feb 2010) when entering from Cambodia overland (previously was not available), with an official "Visa on Arrival" office incorporated into the checkpoint. The nearest Cambodian town is Stung Treng, and the border is a 90-minute speedboat or bus ride away. Note that the border is lightly used, with almost no onward public transport available at the border (therefore book through transport from Stung Treng to Ban Nakasang for Si Phan Don/Don Det) and both customs officers and transport providers have a reputation of gouging foreigners, although this seems to have improved recently (currently both Cambodian and Laos border officials request US$1 stamp fee per country). Crossing the border (Oct 2010) the Cambodia officers will ask for US$1 for exit stamp.You can tell them you don't have any and they will still stamp it. On the Laos side they will demand US$2 for entry stamp, if you refuse they will not stamp it, (you will need the stamp to get out), so you have no choice than to pay the bribe. Note if you cross the border by boat, you will have to return by road to the border checkpoint to officiate your arrival (i.e. get your passport stamped) in Laos. On arriving to the Cambodian border via Laos, Laotian Customs officials will charge you $2USD to exit the country. This unofficial fee seems hard to avoid. Cambodian Visa are purchased for $35 from a small wooden shack on the right hand sight of the road. Despite the suspicious looking building and laminated price board that does not specify currency in USD this office is legitimate. No fees are charged for stamping. Do watch out though for a well dressed man in suit pants and a shirt. He first greets travellers on getting out of the bus at the Laos side of the border and will then travel with you on the bus into Cambodia. He will offer his services to process your visa for an extra fee and then whilst on the Cambodian bus will make various claims such as: Road to Siem Reap is closed, You can upgrade to a better bus in Stung Treng, You can upgrade to a 'new road' to Siem Reap vs bad 'old road', The Bus will take 14 hours as it will need to travel via Phnom Penh first before reaching Siem Reap. The costs of these upgrades will vary from day to day, but I have heard prices from $10-$15USD. Speak to your bus group about this and stand firm and insist that you are not paying any extra fees. If you have booked an organized tour to cross the border from Cambodia to Laos, an 'official' in the bus may ask you for your passport and about 40$ for the stamps and the visa. Insist on doing the procedure on your own. That will safe you around 5$. Two pitfalls at the Lao-Cambodian border are that you will often have four changes of bus (some of them tiny minibuses where passengers have to sit on each others' laps), and hours spent driving to remote guesthouses to pick up backpackers; if your luggage has been sent in a bus you are not on (because of 'lack of space') it will sometimes disappear. The 'King of Bus' company is known to do this. The land crossing between Mengla (Yunnan) and Boten (Laos) is open to foreigners and visa on arrival is possible (USD37 for UK citizens) or you can get in advance at the Lao consulate in Kunming. Daily bus service operates from Mengla to Luang Namtha and Udomxai. Buses from Mengla to Luang Namtha leave from the North bus station. The first bus leaves around 08:00 and costs about 40 RMB. Generally speaking, it is not possible for independent travellers to cross from China to Laos via the Mekong River, not least because there's a chunk of Myanmar in the middle and the Lao checkpoint at Xieng Kok does not issue visas on arrival. Travel agents in China, including Panda Travel , run irregular cruises from Jinghong (China) via Chiang Saen (Thailand) to Huay Xai (Laos), but schedules are erratic and prices expensive. Foreigners cannot legally cross the Laos/Myanmar border. Huay Xai/Chiang Khong: Fourth Friendship Bridge completed in Dec2013. Boat crossing no longer available for foreigners. Usual route to/from Luang Prabang, easy bus connections to Chiang Rai and points beyond on the Thai side. Muang Ngeun/Huay Kon: Visa on arrival. 40 km from Pak Beng. Nam Hueng/Tha Li: Easily reached via Loei on the Thai side, but 378 km of dirt road away from Luang Prabang. No visa on arrival. Vientiane/Nong Khai: The first Friendship Bridge and the busiest of crossing of them all. Direct trains from Bangkok now available. Paksan/Bueng Kan: No visa on arrival. Tha Khaek/Nakhon Phanom: Third Bridge Completed. Savannakhet/Mukdahan: The Second Thai-Lao Friendship Bridge. You can get a Visa in Hanoi at the easy going Visa department, which is located at 40 Quang Trung street (a few meters away from the consulate). Opening hours are 8:30 - 11:30 and 13:30 - 16:00. Prices depend on the country you are living in and there is a 3 day process time unless you pay an extra 5$ (pick it up in the afternoon) or 2$ (ready the next day). If you add the 5$, prices seem similar to those for Visa on arrival (not confirmed). The border crossing on a Vietnamese motorbike at Tay Trang is very easy and straightforward. You arrive after going over some hills at the Vietnamese border where very friendly guys handle your case easily and with no hassle. You fill out the form for "temporary export of a vehicle", show them the Vietnamese Registration Card for the bike (which is in the owners name, not yours usually) and pay USD10. Then you proceed to the police, show the papers to them and get the exit stamp. You then have to drive for 6km over the mountains to get to the Lao checkpoint. There you will find some not so friendly border guards who expect you to pay 5,000 kip for general fees and 25,000 kip for importing a vehicle( that's roughly three US dollars). They fill out the form themselves and issue a 30-day visa (there is some talk on the Internet about 15-day visa or even 7-day arriving on a bike, but that's crap). So after spending maybe 20min on at each border you and your bike are in Laos and the journey can go on! However, some travellers experience huge complications at the Tay Trang border, trying to pass the border with a motorbike and being requested to produce an incredible amount of paperwork (licence for the bike has to be from the same province as your resident card...). Update 2014/03: Some travellers have been denied exiting Vietnam at Tay Trang as their motorbike was not licensed in the Dien Bien district (plate number 27). It doesn't seem possible anymore to cross for travellers with just the blue card, except if you are a Vietnamese resident with all the motorbike papers in order. Being in transit by air, road or river in Laos can be as rewarding as the destination itself - but allow plenty of leeway in your schedule for the near-inevitable delays, cancellations and breakdowns. State carrier Lao Airlines has a near-monopoly on domestic flights, a dodgy safety history in the past, but a good safety record now. The fairly comprehensive network is by far the fastest (and, relatively speaking, the safest) way of reaching many parts of the country. As of 2014, the popular Vientiane-Luang Prabang route costs about USD200 (one-way), but covers in 40 minutes what would take you at least ten to twelve hours by bus. Flights to more remote destinations, though, are flown on the Xian MA60, a Chinese knockoff of the Soviet An-24, and are frequently cancelled without warning if the weather is bad or not enough passengers show up. Lao Airlines also flies 14-passenger Cessnas from Vientiane to Phongsali, Sam Neua and Sainyabuli (Xayabouly) several times a week. These airfields are all rudimentary and flights are cancelled at the drop of a hat if weather is less than perfect. Minibuses are quicker and more expensive, however that doesn't mean they are necessarily better. A typical VIP Bus is just an old bus by Western standards (generally retired Chinese tour buses), and may be more prone to breakdowns, but they usually have more leg room which can make a long journey much more comfortable. VIP buses also include a bottle of water, a snack and a stop for lunch/dinner. Both types are usually air conditioned (though it doesn't always work). Even more expensive, but certainly the most convenient, is a rented car with driver. A car with a driver will cost around $95 USD per day. Some can even drive over the border to Thailand, China, Cambodia and Vietnam. The cars can be arranged at tour agencies, tourist hotels and car rental companies. The cars are new, so they're reliable. They have the bonus of your being able to stop the car at any time for photos, nosing around a village or just stretching your legs. The highways in Laos have improved in the past ten years, but the fact that 80% remain unpaved is a telling statistic. Still, the main routes connecting Vientiane, Vang Vieng, Luang Prabang and Savannakhet are now asphalt, and the transport options on these roads include bus, minibus, and converted truck. Luang Prabang to Phonsavan - minibus: cramped, so arrive early to get good seats as near the front as possible; beautiful views so secure a window seat if possible. Phonsavan to Sam Neua - converted pickup truck: beautiful views but lots of hills and bends, hence possible nausea. Sam Neua to Muang Ngoi - minivan: a 12 hour trip along a horrible road; good views and a necessary evil, but fun if you're prepared to get a few knocks and talk to some Lao people who are, after all, in the same boat. Muang Ngoi to Luang Namtha - Minivan: 10 hour trip (Oudomxay); OK road, much travelled by backpackers. Luang Namtha to Huay Xai - road only passable in the dry season, but the same journey can be made by boat in the rainy season. China is building a new road to Thailand. The road from Luang Namtha to Huay Xai is part of this road and it is a very good road. Paksan to Phonsavan - the road from Paksan to Phonsavan is steadily improving and most of it is paved. Only one bridge remains to be completed and even this is expected to be done by the end of 2012. Travel time from Paksan to Phonsavan is now 4-5 hrs, a great improvment to the 16-20 hrs experieced only a few year ago. Public bus is available from Vientiane and Paksan on a daily schedule. The small town of Tha Thom is half way between Paksan and Phonsavan and several guesthouses and noodle shops line the road. The lush primary forest once boasted about is fast disappearing due to logging. However, it is still a beautiful way to travel and much quicker than Route 13 from Vientiane to Phonsavan. Local transport (less than 20km) in Laos consists of tuk-tuks, jumbos, and samlors (motorised three or four wheelers). A jumbo should cost no more than 20,000 kip (about US$2.50) for short journeys of 1-5 km. You can now also travel the entire length of the country using a fully guided 'hop-on hop-off' bus service provided by Stray Travel. This is the only guided hop-on hop-off bus in South East Asia. Especially women' should be aware that often during lengthy bus or minibus trips there is no opportunity to go to the toilet during breaks, so it may be advisable to wear a wide skirt. As of January/February 2015 this is no longer true while buses and minibuses make toilet stops. Important You can not buy bus tickets in advance, that means that it is often advised to come early to the bus station and book your ticket, especially for the more popular routes. http://vientianebus.org.la/Airport_Shuttle.html The Airport Shuttle Bus service is provided by Vientiane Capital State Bus Enterprise (VCSBE). The price from the airport to the city center is only 15,000 kip, which is fixed and the cheapest. It is air-conditioned and operated on schedule. http://vientianebus.org.la/City_route.php The Vientiane Capital State Bus Enterprise (VCSBE) provides 12 routes for the public transportation, including the Airport Shuttle Service. The price is from 3,000 to 15,000 kip, which is the cheapest among the other available transportation in Vientiane. The bus location can be monitored from your smartphone, so it makes easy to catch the bus. A songthaew (ສອງແຖວ) is a truck-based vehicle with a pair of bench seats in the back, one on either side — hence the name, which means "two rows" in Thai. In English tourist literature, they're occasionally called "minibuses". By far the most common type is based on a pick-up truck and has a roof and open sides. Larger types start life as small lorries, and may have windows, and an additional central bench; smaller types are converted micro-vans, with a front bench facing backwards and a rear bench facing forwards. Songthaews are operated extensively as local buses (generally the most economical way to travel shorter distances) and also as taxis; sometimes the same vehicle will be used for both. Be careful if asking a songthaew to take you to someplace if there is nobody in the back, the driver might charge you the taxi price. In this case, check the price of the ride before embarking. Pakse is a good place to rent and plan a trip around the deep south (know as 'the southern loop') to places like Tad Lo (a multi-tiered waterfall with an old rustic village built next to it), Sekong and Attapeu; all are very possible to do on a simple 110cc scooter as all the roads are paved, quiet and in generally good condition. Hiring in Phonsavan to see the 'Plain of Jars' by yourself is also easy, though a 110cc will struggle on the sandy/rocky 'roads' between the jar sites so drive extremely carefully or upgrade to a 250cc Baja which is designed for such off-road conditions. Luang Prabang also has plenty of bike hires: Just ask at any guesthouse or tour agency. A 110cc scooter is fine for driving to Kuang Si waterfall (and it is a beautiful ride) as the roads are paved pretty much all the way to the waterfall. It's also handy for driving to places just outside town like the silk village, and just getting around town (though you can really walk most of Luang Prabang). Vang Vieng is also very easy: However, the 'roads' to the far away caves and lagoons consist of rocks, sand and a lot of mud (especially in rainy season), so doing it on a 110cc scooter is pretty difficult. Drive VERY carefully. You probably wont be able to top 20KPH most the time, so plan ahead, be patient and be prepared for a shaky ride: Get a Baja 250cc instead if you can ride them. GT Rider is hands-down the absolute best road map of Laos and is highly recommended/virtually essential if you plan on biking anywhere; You can buy it online here: http://www.gt-rider.com/maps-of-thailand-laos-maps/laos-guide-map or certain shops and guesthouses in Pakse/Vientiane often stock it. The quality of machines varies from shop to shop so you need to fully inspect your new friend before you head out on the road. There are many good roads and many paved ones and touring Laos is done easily. Most bikes in Laos are Honda Baja or XR 250 dual purpose bikes and anything else is usually mechanically questionable. Helmets are not only mandatory in the country but a valuable item in a place where traffic rules are made up by the minute. Police have been cracking down on people who do no have a motorcycle licence, so expect to pay a fine if caught without one. Though don't worry too much about this: Drive sensibly and you wont be pulled over, and even if you do you can usually barter the fine down to a couple of dollars with a friendly smile, showing respect and gentle bartering. Lao traffic police are definitely not as notorious for extracting bribes from falang as say, Cambodian cops in Phnom Penh. Cycling is a great option with quiet roads. Laos offers wonderful remote areas to discover, very little traveled roads, friendly people and even some companies providing cycling tours with the help of professional guides all over the country. The more time people seem to spent in Laos the more they seem to like the quiet travel mood and the opportunity to actually be in contact with the people along the way. Good maps are available about the roads in Laos and all major routes are with good roads. In normal distances you find simple guest houses and in all major towns better choices and restaurant. Food is not a problem as long as you remember to carry some stuff with you. Tropical fruits and noodle soup are popular choices. There are a number of local operators running a wide selection of guided mountain biking tours through Laos. If you travel on your own, there are very few proper bike shops outside of Vientiane, especially for bikes with 28 inches wheels. Bring your equipment with you and make sure you get contact details of a supplier, maybe from Thailand. Some may prefer the speed of a motorbike, but note that some roads are still not ideal for a scooter due to the poor balance of many bikes. Boats along the Mekong and its tributaries are useful shortcuts for the horrible roads, although as the road network improves, river services are slowly drying up, and many of the remaining services only run in the wet season, when the Mekong floods and becomes more navigable. Huay Xai (on the border with Thailand) to Luang Prabang and travel south of Pakse are the main routes still in use. There are so-called slow boats and speedboats - the latter being tiny lightweight craft equipped with powerful motors that literally skid across the water at high speeds. Many people go from Chiang Khong in Thailand via the border town of Houai Xai down the Mekong to the marvellous city (if you can call a town of 16,000 a city) of Luang Prabang. The journey takes two days and is very scenic. Apart from that, it is a floating backpacker ghetto with no (good) food sold & so bring your own, cramped and considerably hot. Be sure to bring a good book, something soft for the wooden benches and your patience. Recently the boats have considerably improved. They now have soft used car seats, and serve pre-cooked food, which is not great but certainly sufficient. Luxury boats are very expensive. An attractive choice for some, with a 6 hour journey from Huay Xai to Luang Prabang, as compared to the two-day trip on the slow boat, but not for the faint of heart. Expect to be crammed into a modified canoe made for 4, with 10 other people, along with all the luggage somehow packed in. Expect to sit on the floor of the canoe, as there are no seats, with your knees against your chin for the full 6 hours. Expect an incredibly loud engine inches behind your head. Expect the engine to break a few times, and stops for delays to fix it. However when, or if, you arrive you will never be happier to see Luang Prabang. Stories of small, overloaded speedboats sinking or hitting driftwood are common, but if you are a good swimmer, take comfort in the fact that you can see both shores throughout the entire trip. The choice between the slow boat and the speedboat is largely based on your required comfort level; would you prefer a slow unpleasant trip, or a faster but more dangerous & unpleasant trip? Either way, the scenery along the way is gorgeous and unexploited, and Luang Prabang is an incredible city that is worth a thousand of these journeys. Though helpful in saving time, speedboats are not without danger: built to carry 8 passengers, they are often overloaded; the engine noise is well above a healthy level, which could be a serious hazard to your ears, especially if you are on the boat for a long time (as well as causing considerable noise pollution, scaring wildlife and spoiling the peaceful river life); and fatalities resulting from capsize due to incautious maneuvering, or hitting floating logs or hidden rocks, have been reported (and exaggerated by competing slow boat owners, some say...) However, the vast majority of speedboat users have no serious problems. If you are taller than the average Laotian (many are), are a bit claustrophobic and/or have inflexible leg muscles you are guaranteed an extremely uncomfortable experience for several endless hours. bring a coat in the cold season, the strong wind can make you feel cold even at temperatures of 25C. The official language of Laos is Lao, a tonal language closely related to Thai. Thanks to ubiquitous Thai broadcast media most Lao understand Thai fairly well, but it's worth learning a few basic expressions in Lao. Most younger people prefer to learn English over other foreign languages in school, so young people generally know some basic English, though proficiency is generally poor. French, a legacy of the colonial days, still features on signs and is understood by some older people, but these days English is far more popular. Tourist areas will sometimes have school children who will practice their English with you as part of their curricular requirements. They may after a conversation, ask you to sign a form or pose for a photo with you as proof that this conversation took place. These conversations can be a great time to gain some local ideas for your next sightseeing trip. There are two main ways to turn the Lao script into the Latin alphabet: either French-style spellings like Houeisay, or English-style spellings like Huay Xai. While government documents seem to prefer the French style, the English spellings are becoming more common. The latter is used on Wikitravel. Two pronunciation tips: Vientiane is pronounced "Wieng Chan", and the letter x is always read as an "s". The term wilderness is much misused, but it can truly be applied to much of Laos. The mighty Mekong river and its tributaries together create perhaps the single most important geographic feature of the country. Its meandering path in the North has created some of the most stunning limestone karsts anywhere on earth. The backpacker-central town of Vang Vieng is a commonly used base for exploring the karsts. Further north, the terrain becomes more hilly, and the jungle less explored. Luang Namtha is the far-northern town which makes the best base for those visitors who really want to see the truly remote Lao wilderness, and directly experience the lifestyles of the various hill tribes in this region. In direct contrast to Northern Laos, the Mekong delta lowlands in the South are perfectly flat. Si Phan Don (four thousand islands) is a great base for experiencing what is surely the most chilled and relaxed region anywhere in Asia. Experiencing local village life, taking it all in and doing absolutely nothing should be the aim here. There are also some wonderful river-based sights, including the largest falls anywhere in Southeast Asia. If you are lucky you might get a close-up view of a Mekong pink dolphin. In this most Buddhist of nations, it is no surprise that temples are a key attraction. In the capital city of Vientiane, the three-layered gilded stupa of Pha That Luang is the national symbol and most important religious monument in the country, dating from the 16th century. There are numerous other beautiful temples which on their own make a stay in the capital city vital for any visitor to Laos. The whole of the ancient capital of Luang Prabang is a UNESCO World Heritage Site. Befitting that status, this is a truly unique city. 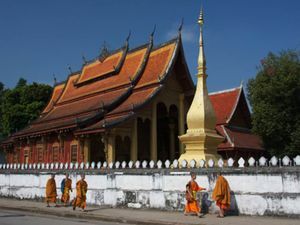 Beautifully preserved gilded temples with their attendant orange-robed monks mold almost seamlessly with traditional wooden Lao houses and grand properties from the French colonial era. Spotlessly clean streets with a thriving café culture on the banks of the Mekong and the Nam Khan, complete the picture of a city which is almost too pleasant to be true. The Plain of Jars is a megalithic archaeological landscape dating from the Iron Age. Thousands of stone jars are scattered over a large area of the low foothills near Phonsavan. The main archaeological theory is that the jars formed part of Iron Age burial rituals in the area, but this is by no means proven, and a great deal of mystery remains. The area suffered tragic damage from American bombing during the secret war of the 1960s, and many unexploded bombs remain. When that process is complete it is very likely this will be declared a UNESCO World Heritage site. 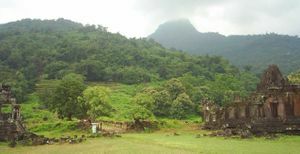 Wat Phu is a ruined Hindu Khmer temple complex in Champasak province. It dates from the 12th century and visitors who have been to Angkor Wat will notice the similarities. The town of Vieng Xai provides a striking insight in the recent history of not only Laos, but the whole of Indochina. In 1964, the US began intensive bombing of the Lao communist movement – Pathet Lao – bases in Xieng Khouang. Under much bombardment, the Pathet Lao moved east to Vieng Xai and established their headquarters in the limestone karst cave networks around the town. A whole 'Hidden City' was established which supported around 20,000 people. During nine years of almost constant American bombing, the Pathet Lao sheltered in these caves, and lived in a largely subterranean environment. Schools, hospitals, and markets as well as government ministries, a radio station, a theatre and military barracks were all hidden in the caves. After the 1973 ceasefire, Vieng Xai briefly became the capital of Laos, before that function was moved to Vientiane in 1975. There are formal daily tours of the caves. Sustainable tourism is becoming increasingly popular, and there are a few organizations jumpstarting this movement in Laos. Mandalao is an intimate non-ride elephant experience with conservation at the core of its mission. Pha Tad Ke is the country's first botanical garden dedicated to biodiversity conservation, sustainable agriculture and ecotourism. With over 2,000 plant species identified and protected, it's goal is to create a research institute under which the local Lao people can advance their understanding about this crucial conservation work. Trekking in mountainous Northern Laos is popular, and this often includes homestays in minority tribe villages. The main hub for this is Luang Namtha where the two day Ban Nalan Trail is especially notable. The trek route goes through the Nam Ha National Protected Area, and involves staying in Khmu villages. Other trekking hubs include Oudomxay, south of Luang Namtha, and Pakse in southern Laos. Kayaking can be arranged in a wide number of locations. The ambitious traveler could kayak the Mekong between Luang Prabang and Vientiane. Tubing (floating down the river on a large inflatable tube) is one of the attractions of the Southeast Asia backpacker circuit. The hugely popular stretch of the Nam Song at Vang Vieng is lined with bars that lure you and your tube in with ziplines, water slides, loud music, buckets of terrible local whisky and unlimited Beerlao. If you're more interested in enjoying the scenery, quieter tubing locations include Si Phan Don, Nong Khiaw and Mung Ngoi. As of Jan 2016 there are two bars open on the river everyday. The staff that help out at the river bars are very helpful and will advise you on all things Vang Vieng. Safety first, always ensure that if it is getting dark that you do not tube down the entire river but to get out on the left side where a tuk-tuk will bring you back into town for 10,000kip if in a group, more if you are on your own (roughly 1USD). Staff can tell you exactly where the tuk-tuks park. Tubing doesn't need to be pre-organised, just rock up to one of the two tubing stations in VV and as part of your tube rental fee they will drop you the start point. Good time to start is about 12 noon and will finish up about 5;30/6pm. Slushies on the river are yum and pretty strong. The staff usually organise games that allow you to win free shots at the bars. Its always better with a bigger group so its important to stay at the first bar until it closes and then move to the second when the first closes. River cruises are a popular way to take in Laotian scenery, and options include working your way up or down the Mekong. The limestone karst formations in Northern Laos are ideal for rock climbing. Vang Vieng is the main rock-climbing centre but climbs are also possible further north at Nong Khiaw and Mung Ngoi. Enter and pay. Typically the rate is around 10,000 kip, plus around 40,000 kip for an optional massage afterward. Go to the changing room, take off your clothes and wrap yourself up in a sarong which is usually provided. Keeping yourself modestly sarong-clad, go to the shower or water bucket in one corner and clean yourself. Plunge into the sauna room. It will be dark, hot and steamy inside, with intense herbal scents of lemongrass and whatever the sauna master is cooking that day. You will soon start to sweat profusely. When you've had enough, exit the sauna, sip on a little weak tea and marvel at how the tropical heat of the day now feels cool and refreshing. The Lao currency is the kip, which can now be exchanged at banks in neighbouring countries due to the establishment of the Lao stock market in 2011. Kip can be exchanged back into foreign currencies at Vientiane airport. The largest note is 100,000 kip and uncommon; the notes in common circulation are 500, 1000, 2000, 5000, 10,000, 20,000 and 50,000 kip. Withdrawing the maximum of 1,000,000 kip from an ATM could result in 50 notes of 20,000 kip each. This makes carrying large quantities of kip quite inconvenient. Although less common than in the past US$ can sometimes be accepted, although usually at about 5-10% less than the official rate. ANZ bank and Banque Franco-Lao ATMs allow for withdrawals of up to 2,000,000 kip, however they charge 40,000 kip per transaction, double the normal rate. This greater cost may be significantly offset by your domestic bank only charging the one transaction fee for a withdrawal which may otherwise have required two transactions. BCEL ATMs allow 1,500,000 kip with a charge of 20,000 kip. Thai baht can also be accepted in many areas near the border, notably Vientiane. Beware though, that in remote places only kip is accepted and no ATMs will be available, so plan ahead. More touristy places and banks are also accept the euro. Bringing euros could be cheaper than changing euros into baht or US$ and then into kip. There are many ATMs in Vientiane, and they have also appeared in other major cities including Luang Prabang, Vang Vieng, Savannekhet, Tha Khaek, Pakse and Luang Namtha. BCEL , the largest bank, accepts both Visa/Cirrus and MasterCard/Maestro, but surcharges of US$1-2 apply. VietinBank in Vientiane allow up to 1,750000 Kip withdrawals with no fees. The ATM is located on 29 Khounboulom Rd. Many banks, travel agents and guest houses will allow you to take out cash from a credit card as a cash advance. This usually occurs by withdrawing the money in US$ from the card as a cash advance; the card issuer will usually charge a fee (about 3%), the Lao bank involved will charge about 3%, and then the agent providing the cash advance might (or might not) charge another 3%, and then the amount is converted from US$ to kip at a poor rate to the US dollars, costing another 5% or so - hence, overall, these transactions are much more expensive than the typical charge for withdrawing cash from ATMs in other countries. However, as for example euros get pretty bad rates compared to US dollars when exchanged in Laos, getting a cash advance in US$ and changing it to kips might actually save money compared to bringing euros with you to Laos. Expats living in Vientiane routinely get cash from ATMs in Nong Khai or Udon Thani (Thailand), where the maximum per transaction is mostly 20,000 baht, or ten times what you'll get in Laos. The use of both ATMs and credit cards in banks is subject to computer operation, staff's computer skills, power cuts, telephone network breakdowns, National Day, etc etc. A few travellers have been forced out of the country prematurely as they couldn't withdraw funds to further their travels. Always bring cash as well. Changing money can be next to impossible outside major towns. Banks give good rates, and private exchange booths are common in the major tourist areas. Many shops start an hour's lunch break at noon, and some maintain the (now abolished) official French two-hour break. Nearly everything is closed on Sundays, except restaurants and many shops. Some Laotians consider tourists as "cash cows", and whilst not as bad as in Vietnam they will take whatever tourists are willing to pay; however honest and decent Laotians far out number the dodgy characters, especially outside the main tourist areas. Hotels are of lower quality for higher prices than in Thailand or Cambodia, the dishes in restaurants are smaller and the tuk-tuks more of a rip-off. As can be expected it's worse in the tourist centres of Luang Prabang and Vang Vieng than in the smaller towns and villages. A budget of US$40 a day is a good rule of thumb, though it's possible to get by on less. A basic room with shared bathroom can be as little as US$6 in Vang Vieng, rising to US$10-15 in Vientiane and Luang Prabang. Meals are usually under US$5 for even the most elaborate Lao, Thai or Vietnamese dishes although western food is more expensive. A local bus from Vientiane to Vang Vieng costs US$5; the slow boat from Luang Prabang to Huay Xai costs US$25. You'll find that most temples are setup to capitalize on foreigners as cash cows, and will charge you a higher price for being a foreigner. If you can't speak Laotian like a native you'll be charged a higher price. Wat Sisaket charges Lao/Isaan speakers 2000 Kip, and foreigners are expected to pay 5000 kip. If pricing based on your origin sounds unfair to you, than you're probably best to avoid temples. Unlike in Thailand access to temples in Luang Prabang is not free, with an entrance fee typically being 10,000 kip. Laos is more expensive than Thailand and Cambodia, as most goods, petrol & food is imported from Thailand and Vietnam. Also, some people, and especially tuk tuk drivers, consider USD1 as being equivalent to 10,000 kip, whereas the official exchange rate is better. Outside of tourist centres rooms can be as low as USD2.50 per night and even at Si Phan Don for USD5/night. A large bowl of noodle soup is around USD1, as are large bottles of Beer Laos. Excluding transportation, living on USD15/day should not be too difficult. Lao cuisine is very similar to the food eaten in the north-eastern Isaan region of Thailand: very spicy, more often bitter than sweet, and using lots of fresh herbs and vegetables served raw. Some of the raw vegetables can be used to cool your mouth when the chilis are overwhelming. There is also French cuisine. Such as French cafe. Brought by France. Rice is the staple carbohydrate. The standard kind is sticky rice (ເຂົ້າໜຽວ khao niaow), eaten by hand from small baskets called tip khao. Using your right hand, pinch off a bit, roll into a ball, dip and munch away. The national dish is laap (ລາບ, also larb), a "salad" of minced meat mixed with herbs, spices, lime juice and, more often than not, blistering amounts of chili. Unlike Thai larb, the Lao version can use raw meat (dip) instead of cooked meat (suk), and if prepared with seafood makes a tasty if spicy carpaccio. Another Lao invention is tam maak hung (ຕໍາຫມາກຫຸ່ງ), the spicy green papaya salad known as som tam in Thailand, but which the Lao like to dress with fermented crab (ປູດອງ pudem) and a chunky, intense fish sauce called pa daek (ປາແດກ), resulting in a stronger flavor than the milder, sweeter Thai style. Other popular dishes include ping kai, spicy grilled chicken, and mok pa, fish steamed in a banana leaf. In addition to purely Lao food, culinary imports from other countries are common. Khao jii pat-te, French baguettes stuffed with pâté, and foe (pho) noodles from China are both ubiquitous snacks particularly popular at breakfast. Note that foe can refer both to thin rice noodles (Vietnamese pho) as well as the wide flat noodles that would be called kuay tiow in Thailand. The legal drinking/purchasing age of alcoholic beverages is 18. However, there is no legal drinking age when off alcohol-selling premises(restaurants, bars, etc.). Note, Laos does NOT tolerate drunk driving, and you may will end up in lengthy prison sentence. The national drink of Laos is the ubiquitous and tasty Beer Lao, made with Laotian jasmine rice and one of the few Lao exports.It maintains an almost mythical status amongst travellers and world beer aficionados. The yellow logo with its tiger-head silhouette can be seen everywhere, and a large 640 ml bottle shouldn't cost more than 10,000 to 15,000 kip in restaurants. It's available in three versions: original (5%), Dark (6.5%) and Light (2.9%). The brewery claims they have 99% market share. Rice spirit, known as lao-lao, is everywhere and at less than US$0.30 per 750 ml bottle is the cheapest way to get drunk. Beware, as quality and distilling standards vary wildly, as will your behaviour. Lao coffee (kaafeh) is recognised to be of very high quality. It's grown on the Bolaven Plateau in the south; a few prominent brands are Sinouk Coffee and Lao Mountain Coffee. Unlike Thai coffees, Lao coffee is not flavoured with ground tamarind seed. To make sure you aren't fed overpriced Nescafé instead, be sure to ask for kaafeh thung. By default in lower end establishments, kaafeh lao comes with sugar and condensed milk; black coffee is kaafeh dam, coffee with milk ( although you'll often be given non-dairy creamer) is kaafeh nom. Tap water is not drinkable, but bottled water is cheap and widely available. There is not much nightlife outside of Vientiane and Vang Vieng. To have a beer in some places, simply visit a restaurant. Something to note however is that some areas may be so laid back that they will expect you to keep track of of what you have drunk, with the odd guest house asking how much you have drunk during your stay upon check out. Accommodation options outside the Mekong Valley's main tourist spots are limited to basic hotels and guest houses, but there are many budget and mid-price hotels and guest houses and quite a few fancy hotels in Vientiane and Luang Prabang. Pakse has the Champasak Palace. Lao work permits are difficult to obtain, unless you can secure employment. English teaching is possible but is often poorly paid (US$5-8/hour). Some establishments pay a very competitive wage for English teaching but these jobs are generally given to people who stay in the country long-term. Vientiane College pays $22-35/hr for English teaching, while mid-range teaching gigs (Panyathip, Anousone, 21st Century) pay around $12/hr or $1000-1500 per month for full time. Getting work with NGOs is possible but most entry-level work will offer a living stipend of $500 per month. Laos is an excellent place to work because of the easy-going lifestyle and low cost of living but one must remember not to flaunt their wealth or talk about salary as local restaurant workers often make $50 per month and many young degree-holding locals make about $125 per month. You can obtain a work visa after you're employed but most small companies will make you cover the cost of usually over $400. You can buy a work visa from some agents for around $500 but this is not recommended as it is illegal and could make border crossings more difficult for you. One of the most interesting ways to get to know a country, and which has become increasingly popular, is to volunteer. One organization that offers volunteer work in Laos is Travel to Teach . To get a broader overview of all the organizations that offer volunteer opportunities in Laos, you can search and compare the projects on a comparison platform for international volunteer work. Identification When in Laos, it is important to always have your passport. Copies of your passport and visa are acceptable, and it is recommended to travel with a copy rather than the original. When checking to a hotel, it is convenient to carry a photocopy of your passport and write over it what hotel you're giving it to, to ensure that it can't be reused. Avoid allowing hotels to scan or photocopy your passport, as these digital scans or unmarked photocopies can easily be sold by the hotel for extra money, and used in illegal money laundering operations. You may be asked to show ID at any time, and a fine (100,000kips) will be imposed if you do not produce documentation on request. In Vientiane the Thai ID card is usually accepted, but prepare your passport as well. Crime levels are low in Laos, although petty theft such as bag snatching is not unknown, which is on the rise given the inability of authorities to prevent it. There are reports of robbery at gunpoint in the big cities. Whilst unlikely to affect most tourists, Laos is one of the world's most corrupt countries, and the corruption is a big factor in many citizens' lives. Corruption actually seems to be getting worse and worse as time goes on, especially in the last 4 years. Unfortunately, there are numerous reports now of people who have been arrested and taken to the police station simply because they were sat near someone who had illegal drugs on them. Even worse, there are cases of people having drugs planted on them. Not just in Vang Vieng, but also in Vientiane and Luang Prabang. Sadly the tourist board and complaints department do not care, as is typical in South-East Asia. So be careful and take this warning seriously, because you are very much on your own if unlucky enough to get caught in this situation. If you see anyone who might be on drugs or you think might be carrying drugs (not sure how to tell in the latter case), probably best to leave their vicinity quickly. Or face the possibility of kissing goodbye to 600 Euros and having a highly unpleasant few hours in a prison cell. Always ask to see I.D - these were legit officers in the above case, but the 'fake cop' scam is now appearing in Laos too, like neighboring Cambodia. If they don't show I.D, your options are either to run away (which is generally a bad idea, especially if they have weapons), or if you have a mobile phone, call your embassy or the actual police immediately. Even more sadly, you can thank the former tubing and party scene in Vang Vieng for most of this (which has closed down now, permanently, save for 4 or 5 bars on the river...stay in Thailand if you want a full-moon party), and the amount of "Falang" who were taking drugs. They were a massive source of income for local police when they were caught and made to pay bribes, and unfortunately now many innocent tourists across Laos are also seen as "cash cows" because of these irresponsible teenagers on their gap years presenting this negative image of 'falang' to Lao people. Judicial process remains arbitrary and, while you are unlikely to be hassled, your legal rights can be slim or non-existent if you are accused. As above, as of 2016, your rights are virtually non-existent due to corruption becoming so rife. Entrapment is not illegal, and having drugs planted on you is common, even if you are completely innocent. Cops and the militia in Laos are judge, jury and executioner. When it comes to drugs...Just don't. Sexual relations between a Lao national and a foreigner are illegal unless they are married, and marriage requires special permits. Lao hotels are not permitted to allow a foreigner and Lao national in the same hotel room together. "Number One" condoms are available for 1,000-5,000 kip for a pack of three. These are probably the cheapest condoms in the world and their quality seems to be OK. Drugs are a large problem in Laos and should be avoided at all costs. Lao law makes little distinction between personal use and trafficking and any conviction will result in heavy fines and expulsion at best and imprisonment or even execution at worst. And as explained above, police are now known to arrest (or try to extort a 500 Euro bribe) people simply for being in the general vicinity of people who are taking drugs, and even a few cases of drugs being planted on people. Avoid places after dark (and the curfew) and places you think or know have drugs being sold or consumed. Methamphetamine ("Yaba", sold as orange pills) is widespread and often offered in "special" or "happy" shakes along the backpacker trail. And sadly, it is now often cut (or entirely composed of) with research chemicals from China such as M-Cat (or any other unknown cathinone stimulant), and can also be cut with nasty poisonous metals, like lithium. Be extremely cautious of tuk-tuk drivers offering to sell you drugs (Please see above. Just don't do it at all), as they often collaborate with the police or a police impersonator to "shake down" ($500/500 Euros is the common "fine") unsuspecting tourists. Keep in mind that often times Lao police dress as civilians (so always ask for I.D politely). Heroin: up to life imprisonment and 10 million kip (US$1,316) fine; death penalty for possession of over 500 g.
Illegal chemical substance: up to 20 years imprisonment 50 million kip (US$6,578) fine. Amphetamines: up to 5 years imprisonment and 7 million kip (US$921) fine. Opium: up to 15 years imprisonment and 30 million kip (US$3,947) fine; death penalty for possession of quantities over 3 kg. Marijuana: up to 10 years imprisonment and 20 million kip (US$2,631) fine; death penalty for quantities over 10 kg. Criticism: The Lao government heavily controls all media channels in order to prevent critique of its actions, Lao citizens who have criticized the government have been subjected to enforced disappearances,arbitrary arrests and torture . Because of this, most Lao citizens are hesitant to discuss politics with each other, although they would be more open to speaking to foreigners. Increasing corruption and land grabbing has lead to increased public dismay at the government. At times, tourists do have the freedom to speak openly--mainly with the country's citizens--without such risks, using this freedom to raise awareness and discussion in Laos can be a valuable way to contribute to Lao citizens' capacity to understand and participate in governance. Independent civil society organizations are allowed to exist, but many have to face self-censorship and intimidation by the government in their work. But be aware in interacting with the country's government officials or being in sight of plainclothes government agents, it would be wise not to criticize them/speaking out against the political system as such risks could lead to arrest or deportation as in the case of a NGO director from Switzerland being deported for sending a letter to the Laos Government criticizing them for creating a hostile environment for development and civil society by suppressing freedom of speech and expression. Landmines or unexploded ordinance left over from the Vietnam War maims or kills hundreds of people every year as Laos is the most bombed country in history. Almost all of these occur in the eastern and northern parts of the country, especially near the border with Vietnam. Never enter areas marked as minefields and travel only on paved roads and well-worn paths. If you are unsure of which areas are safe, ask the locals. Fake products are very common. Laos is where Chinese or Thai companies dump sub-standard products. Similar to Myanmar, there are few if any laws preventing such trade. Dogs Stray and also house dogs are often let wander freely by locals. Most are tame and sleepy especially during the day. But some are vicious and can attack. Beware dimly lit streets without much traffic, both in urban and countryside. If wanting to go off busy areas, carry a stick with you. Parts of Laos have a good deal of Malaria so anti-malarials are recommended if visiting those areas for an extended period, but check with health professionals: there are many high incidence of drug-resistant parasites around Laos. Other mosquito-born diseases, such as dengue, can be life-threatening, so make sure you bring at least 25% DEET insect repellent and ensure that you sleep with mosquito protection like nets or at least a fan. Vientiane seems to be malaria-free but not dengue fever-free. The mosquitoes that are active during the day carry dengue and those that are active in the evening carry malaria. The usual precautions regarding food and water are needed. Bottled water is widely available. Vientiane has several medical clinics that are associated with European embassies. Otherwise, you probably have to go to Thailand for better treatment of serious injuries and illnesses. Udon Thani and Chiang Mai are generally recommended; they're only a few hours away, depending on your location in Laos. Ubon Ratchathani and Chiang Rai might have suitable clinics, and, of course, there's Bangkok. Expatriates in Laos probably have the best information; the more upscale hotels can be good resources, as well. Medical travel insurance is a practical option. Visitors always need to examine the local infection information, too. In fact, as Western and European medical industries reported so much, the environment in Laos has infectious issues even now. According to local newspapers, Laos goverment is eager to launch improvement plans of water and foods quality. The travel guide "Lonely Planet" also describes this social reality. However, it is not definitely affecting the tourism market. Laos goverment sides and tourism industries never show the atittude to adjust this serious problem. Dress respectfully. such as long trousers & sleeved shirts, when visiting temples and take your shoes off before entering temple buildings and private houses. As with other Buddhist countries, showing the soles of your feet is very poor manners. Never touch any person on the head. Despite prevelant cheap alcohol, being drunk is considered disrespectful and a loss of face. Things in Laos happen slowly and rarely as scheduled. Keep your cool, as the natives will find humor in any tourist showing anger. They will remain calm, and venting your anger will make everybody involved lose face and is certainly not going to expedite things, particularly if dealing with government bureaucracy. Respect for monks is part of Laotian life, and the monks take their duties seriously. Remember that monks are forbidden to touch women. Some undertake a vow of silence, and will not answer you even if they can understand and speak English. It is best not to compel them to stand next to you for a photograph, or start a conversation, if they seem reluctant. Internet cafés can be found in larger towns, however access speeds are usually painfully slow and cafe staffs have less knowledge. The most reliable connections are in Vientiane, and usually cost around 100 kip/minute, with the cheapest offering 4,000 kip/hour. However, internet security is not guaranteed and computer virus issues are often ignored. Wi-Fi with Mac/Linux laptop or iPad are recommended. Some cafes offer free Wi-Fi-access for customers (check first if it's really free). Many accommodations now offer free Wi-Fi. GPRS via mobile phone is also an option, especially if you have a local or Thai SIM, for those who intend to stay longer term and require mobile internet. Note, that connection quality in Laos is abysmal, even when compared with neighboring countries. Wi-Fi in most if not all accommodations will be painfully slow and very unreliable. Using mobile internet is not a solution either, as even in Vientiane mobile data connection is very poor. You will probably be able to check your email sooner or later, but if you need reliable internet connection e.g. for work purposes - you are in the wrong country. Mobile phone usage in Laos has mushroomed, with four competing GSM operators. Two of these offer roaming services. Calling people on the same network is always cheaper than calling another network, but there is no clear market leader. Tourist and expats tend to prefer Tigo or M-phone (Laotel), while locals could have any of the four networks. Lao Telecom  has agreements with some 30 international networks - see roaming with Lao Telecom . Beeline (formerly known as Tigo)  has agreements with over 100 International phone networks - see roaming with Tigo . Another popular choice, they also have low-cost international rate of 2000 kip/minute to many countries, if you buy their SIM card and dial "177" instead of "+". However, as of February 2009, Tigo's coverage is still said to be poor away from larger towns. Unitel or starphone (the old name of this network) is available too. Local prepaid SIM cards can be purchased in various shops and stores without any paperwork. But be aware that most networks, also including phone and fax traffic, are tapped by government order. As another option, there is Thai GSM coverage close to Thai border (including a significant part of Vientiane), and Thai SIM cards and top-up cards can be bought in Laos; in addition, DeeDial International Call Cards are available. Thus, if you already have Thai number, you can use (generally cheaper) Thai network and/or avoid buying one more SIM. However, beware - if you have a Thai SIM which has international roaming activated it will connect to a Lao network when the Thai network is not available, and the roaming charges will be significantly higher. Postal service in Laos is slow but generally reliable. Other options are Fed Express, DHL & EMS, and exist in various locations. Although these services are much more expensive, they are more reliable. This page was last edited on 5 February 2019, at 07:40.